Chef F and I dove into gingerbread cookie cutout creation in August after sterilizing the contents of a bag of Christmas cookie cutters after pulling them from an area of the basement nauseatingly soiled with mouse poop. Who wouldn’t be inspired to bake? (After getting over the nausea, I mean.) We didn’t actually keep the gingerbread momentum going after that one baking frenzy—because, even we have our limits as to just how much Christmas we can embrace in a single calendar year. But, those summer gingerbread people did lead us into some unexpected and useful science-baker fun. Although I know I may sometimes come across as rather a health food tyrant, I’m all in for keeping forbidden food fixations at bay and wholeheartedly enjoying our food, including the occasional foray into decadence. But when it comes to Christmas cookie baking—which is much more about the sharing, giving, and total atmosphere than the final product— it really gets to me how tough it is to find options for adding color and sparkle that aren’t entirely comprised of junk, replete with chemical dyes and hydrogenated oils. All that said, I can’t deny that adding all that ornamentation is often the best part. What are we health-conscious bakers to do? You know what we did. I already told you. Chef F and I set out to explore some alternatives. I’ll be honest: what we’ve trialed so far doesn’t have the same pop as their junk-filled counterparts. That said—they’re good. Really good. Delicious, with the bonus of offering truly tasty treat gifts that are truly light on guilt. Even better bonus, they’re fun to make, too. And of course we’re not finished. We have more sprinklicious exploring to do. I’ll keep you posted as we go, but here’s a solid start of three I think any cookie-craver is bound to love. Trial one: dried zest coated in crushed, freeze-dried fruit. This recipe from the Kitchen is so good I’m giddy just thinking about it. Also, a little wistful that I didn’t think of it. Sophisticated, tangy, healthy sprinkle hack. It’s adornment and conversation piece, and truly flavorful. Easy, too. Just dehydrate zest (orange, lemon, lime) in an oven at the lowest setting for about an hour, or until dry. Then, pour into a container or bag of crushed, freeze-dried fruit (the crushing part is really fun shared with littles) and store in an airtight container in the freezer. We used a Simple Truth tropical mix, but we’re planning to try with freeze-dried strawberries, mango, and more. Trial two: naturally dyed shredded coconut. This gorgeous idea came from Feasting on Fruit. 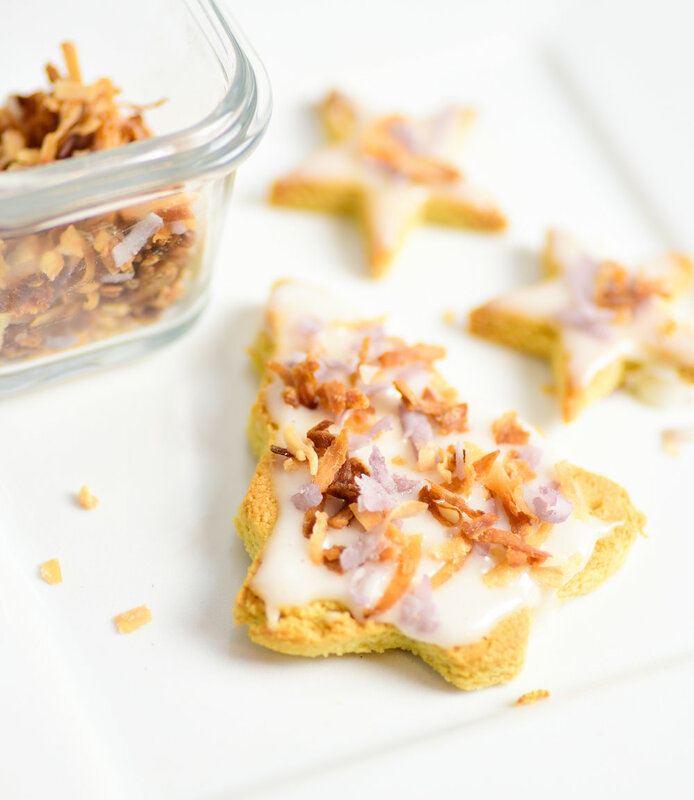 If you don’t like coconut, you may be in for a letdown, but as long as that’s not an issue, you’re going to love how very easy and versatile these are. This post has great specifics, but as a general guide, just color approximately 1/4 cup coconut (unsweetened or sweetened work equally well) with about a tablespoon of natural dye, then let air dry or dry out on your oven’s lowest heat for about an hour. We used juice pressed from defrosted, frozen blueberries to get a fun Halloween-y purple color, and got a light but warm orange from golden beet juice; but you can go with raspberries, turmeric-dyed water, carrot juice, spirulina in water…possibilities are endless. Trial three: Naturally dyed confectioner’s sugar recipe from Chocolate-Covered Katie. I know, the whole point of experimenting with sprinkles was to come up with healthier versions, so why default to a confectioner’s sugar base? Because, that base comes without the really, really nasty junk like corn syrup and hyrdogenated whatzits, and we are talking ultimately about toppings for cookies, after all. Sift the sugar and cornstarch together, being scrupulous about getting out any and all lumps. Add the extract of your choice, and slowly drizzle in the vodka, 1 teaspoon at a time, until the mixture becomes a smooth, very thick paste. Transfer the sprinkle paste into a piping bag fitted with a very small, round tip. Pipe out long lines across either a silpat or piece of parchment paper, spanning the whole length of the surface. Let dry undisturbed in a cool place, for a full 24 hours, until dry to the touch. Colored sprinkles made without the vodka may take longer, so be patient. Gently break the lines into short pieces, and store these vegan sprinkles in an airtight container for up to three months. Here’s the thing: I both have no right to weigh in on this recipe and every right to endorse it, because…I messed up horribly and it still worked out! Go to the original blog link for this one, friends, and see what you can make. And you will. Because no one who bakes can be as awful at piping as I am. Yet, the beauty of it is, Chef F and I LOVED what we created, even after that creation started off as a total, exasperating BLOB! My fave is probably the zesty sprinkles. For Chef F, zesty sprinkles were not a hit UNTIL they were mingled with a light layer of icing. Given the relative low sugar altogether, we could all be happy with that icing. Chef F is easygoing on this one…as long as there is icing under versions one and two (and there really had to be with the cookie recipe we used; they just didn’t stick), he felt there was a three-way tie. Plain on their own, the confectioner’s-corn starch base version and coconut flakes still stood in equal standing. Ultimately, I guess there really was no final verdict. They are all lovely, separate and heaped all together. Win-win-win. Happy cookie baking, friends!